Before 2012 ended, we took a short trip to Bangkok with Burger Boy. What better way to end a really fulfilling year than spending quality time as a family (actually .. quality time shopping for me! ;p ). This was Burger Boy's first time on a plane, and 30 minutes upon boarding the plane, I was seriously on the verge of calling off the trip! Well... I had an energizer bunny on board...and Burger Boy's non-stop bouncing and babbling wasn't what we were expecting. We thought it was going to be more like.. board plane, drink milk at take off, and sleep for 2 hours.... who was I trying to kid?! Anyway...the trip ended very well, and our struggles with Burger on the flight there were soon forgotten. 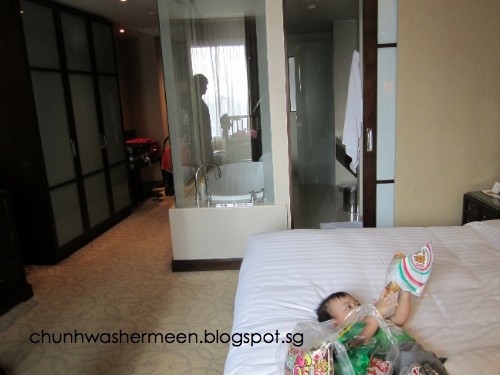 As seasoned travelers to Bangkok, Hwa and myself have stayed at different hotels each time we visit. And, very often, we found ourselves at small boutique outfits. This time, with Burger Boy in toll, we made a conscious effort to look for a good hotel, big enough and comfortable for the 3 of us. So, we picked Grand Millennium, Sukhumvit. Next to the Sukhumvit MRT stattion, close proximity to Asoke BTS....and most importantly, a 2 min walk to Terminal 21. I would say we were right smack in the middle of convenience. The huge bedroom with a King-sized bed. Bathroom was also huge with a seperate peepoo room, shower room & huge tub. View of the room from another angle. Place in a cot, and there's still lots of space to move around. The pool on level 6. Buffet breakfast at level 2. Not only was the room over our expectation, we also enjoyed the buffet breakfast. Well, i wouldn't say that the food was fantastic , but the dining area was spacious, they had a good variety of local and international fare....and what caught my attention was.... they had a pancake machine! Read: M-A-C-H-I-N-E! Ok.. some may say I swa ku... but this machine actually dispenses mini pancakes at the touch of a button! Has anyone of you seen one before? (unfortunately... I was so fascinated by the machine that I forgot to take a picture). Oh! And... they also had a station that made Thai beverage on the spot. So, if you don't want your regular brewed coffee or tea, you can opt to have Thai tea or coffee. This is really a first I have seen in all my travels to Thailand! Thai Iced Tea...freshly made at the Thai beverage station. Grand Millenium certainly got thumbs up from Hwa and myself. While I would have preferred to stay on the same side of the road as Terminal 21, or even at Grande Centrepoint which is right above the shops, I would say it provided the comfort and convenience we were looking for. With a baby, a good hotel makes a huge difference.